SurgicalPerformance expanded its scope to include gynaecological cancer treatment. Emerging surgical techniques are opportunities to offer more effective, more targeted and less invasive surgical approaches to patients. At the same time, they are unexplored and carry risks for patients and liability for the treating surgeon. Only recently, the LACC cervical cancer trial has shown totally unexpected findings. The disease-free survival of patients who had minimally invasive surgery was significantly worse than patients who had open surgery. The presentation of the trial results in March 2018 and the coming publication of the trial results will hopefully lead to fewer women being offered harmful surgery. Similarly, with Sentinel Node Biopsy (SNB) emerging, we don’t know what the downsides of this promising technique are if we don’t monitor its use. SurgicalPerformance is a tool for independent surgeons who are committed to applying the right treatment to patients. SurgicalPerformance surgeons can check on themselves, reflect and take action if they wish to. We are pleased to announce the launch of “Uterine cancer” and “Cervical Cancer” now being part of a standard SurgicalPerformance subscription at no extra cost to users. For uterine cancer – Why would you be interested in checking out your SNB indicators? For example, you may wish to reflect on your personal rate to identify SN bilaterally? For cervical cancer – what is your recurrence rate following laparoscopic or robotic radical hysterectomy? How does your recurrence rate in open versus minimally invasive surgery compare? Without entering data, checking and reflecting on your personal outcomes, you will not know. Join SurgicalPerformance for a FREE trial. 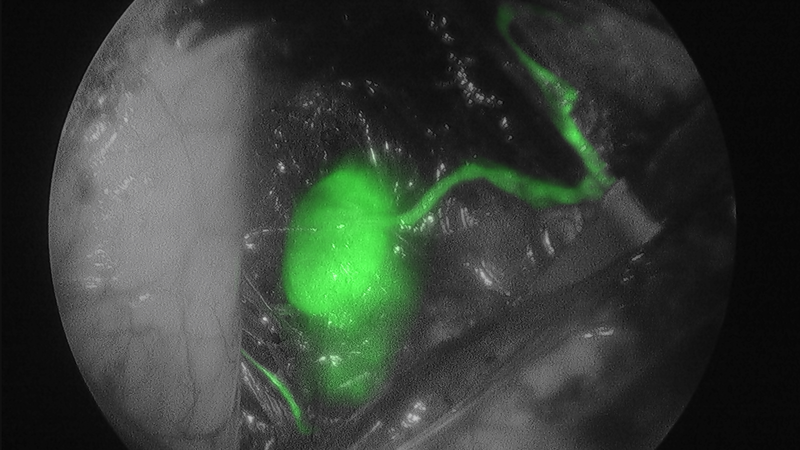 Pictured: A lymphatic channel leading to a Sentinel Node highlighted green.